Jacqueline Meldrum was one of the first food bloggers I got to know when I started blogging all those years ago, back in 2009. 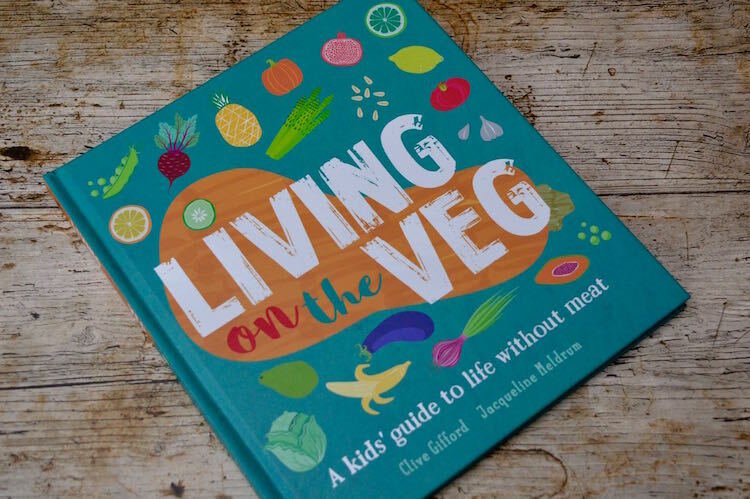 So I’m absolutely delighted to introduce you to her first book, Living on the Veg: A kid’s guide to life without meat – that’s assuming you haven’t come across it already of course. 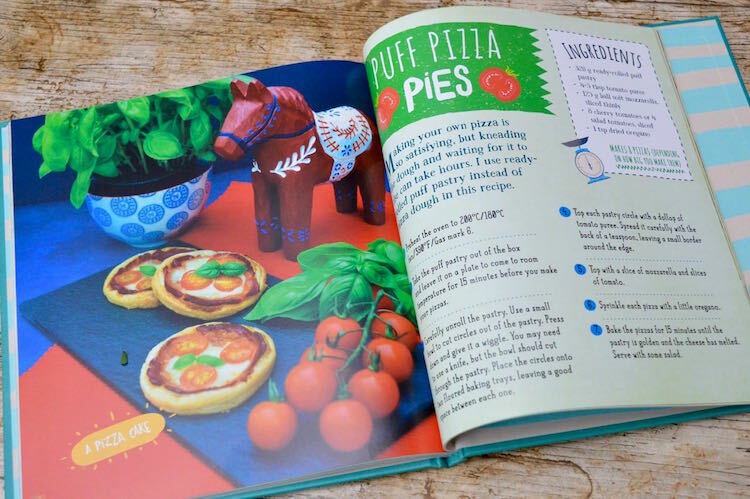 I’ve made one of the recipes from the book already, puff pizza pies and you can find it further down in the post. I’m also able to offer a copy of the book as a giveaway. I just adore the title of this book, Living on the Veg. It makes me chuckle every time I see it. Jac is a Scottish vegetarian food blogger at Tinned Tomatoes where she blogs about the recipes she creates for herself, her vegan husband and vegetarian son. While I say this is Jac’s book, that’s how I think of it, but it’s actually co-authored by children’s author Clive Gifford. Clive covers all the facts about being vegetarian and why it’s a good thing to be, whilst Jac provides the recipes. 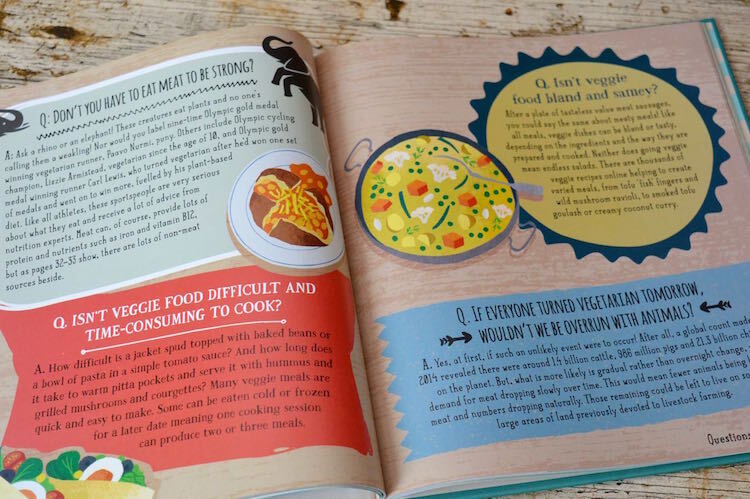 Living on the Veg is aimed at 9-11 year olds, though I reckon most adults toying with vegetarianism or with children who want to stop eating meat would find the book useful and enjoy the food too. I enjoyed reading the book and I’m certainly keen to make most of the recipes. The puff pizza pies were a tasty quick meal and a real hit with CT. I’m now thinking I’d like to try making them in mini galette form using my favourite wholemeal spelt flaky pastry as featured in this gooseberry galette or these vegetarian pasties. The book is a mine of information and helpful advice about vegetarianism and how to give up eating meat. In simple accessible text, it covers such topics as: what a vegetarian is or is not; why people are or want to become vegetarians; environmental concerns, world hunger, healthy living, dietary requirements, special ingredients and most importantly, how to go about becoming a vegetarian. I reckon its colourful and well illustrated content will appeal to any 9-11 year olds with an interest in vegetarianism or cooking. Get Cooking, is the final section of the book. It contains twelve simple to make recipes ranging from cloud eggs for breakfast, to sweet potato and carrot soup for lunch, to 10-minute bean burgers for supper, to strawberry cheesecake no-churn ice cream for dessert. It also includes these gorgeous puff pizza pies. I found the recipes to be diverse, interesting and probably the sorts of food kids would be keen to eat. The only thing that slightly niggled me with the book was that the photos didn’t always match the recipe. The picture of puff pastry pies, for instance, features a basil plant with basil leaves sitting on top of the pizzas rather than the oregano stated in the recipe. If you have kids, Living on the Veg is a great way to introduce them to the concept of being vegetarian, get them cooking and eating their vegetables. Jac has a young son, who is already well versed in the ways of the kitchen and understands what being a vegetarian is all about. Living on the Veg is a hardcover book published by Wayland in 2018 with an RRP of £12.99. If you’re in a hurry and need something quick for supper, these puff pizza pies will do the trick nicely. As Jac says in her book, “making your own pizza is so satisfying, but kneading the dough and waiting for it to rise can take hours”. Using ready-rolled puff pastry is a brilliant cheat. Once you’ve made them, you just need a nice green salad and you’re away. It was the easiest meal I’ve cooked in a very long time. I wasn’t quite sure what size bowl to use, so I used a 9.5 cm cutter, which made twelve mini ‘pizza’ bases. The puff pizza pies were tasty and satisfying. Crisp pastry and melting cheese with a good tomato flavour to cut through the richness. We had three each for supper and the rest served as a very satisfying lunch the next day. Unlike pizza, they were almost as delicious cold as they were hot from the oven. I’m thinking they’d be just perfect for a summer party . Using ready rolled puff pastry instead of kneading dough and waiting for it to rise makes for an easy and almost instant pizza base. The herbed tomato and cheese topping is simple, but delicious. Take the puff pastry out of the fridge and leave it for 10 minutes to come to room temperature. Turn the oven on to 200℃. Carefully unroll the pastry. Use a small bowl to cut circles out of the pastry. I used a 9.5 cm cutter and re-rolled until I'd used all the pastry (made 12 circles). Place circles onto two a floured baking trays, leaving a bit of space between each one. Top each circle with a dollop of tomato puree. Spread it with the back of a teaspoon leaving a small border around the edge (at this point I laid a small sprig of thyme over the puree). Top with a slice of mozzarella, followed by slices of tomato. Sprinkle each pizza with a little oregano (unless you've already added thyme sprigs). Bake for 15 mins until the pastry is golden and the cheese has melted. Recipe from the book 'Living on the Veg: a kids' guide to life without meat. I’m sharing this recipe for puff pizza pies with #CookBlogShare which is being hosted over at Easy Peasy Foodie this week. These puff pizza pies also go to #CookOnceEatTwice with Searching for Spice. Puff Pizza Pies. PIN IT. Wayland Books is offering one Tin and Thyme reader a copy of Living on the Veg; a kids’ guide to life without meat. To be in with a chance of winning, please fill in the Gleam widget below. You will need to leave a comment on this post, answering the question, which then gives you additional chances to enter if you so wish. Gleam will pick a winner at random from the entries received. If you are commenting anonymously, please give me some way of identifying you as I will be verifying the validity of entries. Any automated entries will be disqualified. This giveaway is only open to those with a UK postal address. Winners will need to respond within 5 days of being contacted. Failure to do this may result in another winner being picked. Prizes are offered and provided by Wayland Books and Tin and Thyme accepts no responsibility for the acts or defaults of said third party. Tin and Thyme reserves the right to cancel or amend the giveaway and these terms and conditions without notice. Do take a look at the Tin and Thyme giveaways page to see if there’s anything else you’d like to enter. I was sent a copy of Living on the Veg to review. I was not expected to write a positive review and all opinions are, as always, my own. Thanks to my readers for supporting the brands and organisations that help to keep Tin and Thyme blythe and blogging. I think it mainly involved trying to make ‘secret’ chocolate cornflake cakes before my mum came home! Ooh chocolate cornflake cakes. Now you’re talking. I’m thinking I might have to dash out and get some cornflakes right now. Used to love going to my friends house – we’d raid the pantry for jelly cubes and crisps, she had much more freedom in the kitchen and could make Macaroni Cheese! Gosh yes, jelly cubes. I’d completely forgotten about those. I think I might have done the odd raid for those too. These puffy pizza bites are definitely crowd pleasing and delicious! They’d be great for a party as they are really good cold as well as hot. Works better than pizza in that respect. We made toffee mallow cakes, basically toffee, marshmallows and rice crispies, yum!! These look brilliant! I know my husband and I would love them and probably one of my children. Thanks for sharing with #CookOnceEatTwice! Only one of your children Corina? They are a great pizza cheat. 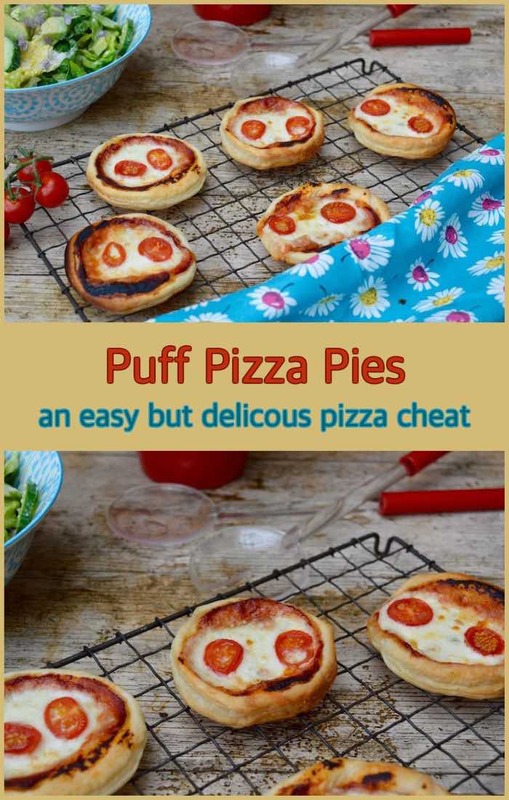 Love the look of these puff pizza pies. Jacqueline’s book looks like such a good resource for those considering a vegetarian diet, not only the recipes but simple straightforward answers to common questions, very informative. Love the design of it too. They are a great pizza cheat and really delicious. I’m really impressed by the book and just wish it had been available to me when I was a kid. Thanks for the lovely review Choclette. Actually the basil on the pizzas was just to make them look bonnie and as a visual suggestion. They have oregano sprinkled on them. My boy doesn’t like the basil on them, I do, but it shrivels as it cooks, so I sometimes add it after they cook but didn’t include it in the recipe. We all seemed to have a pretty serious obsession with conkers – half the fun was collecting and then bashing them around all playtime! 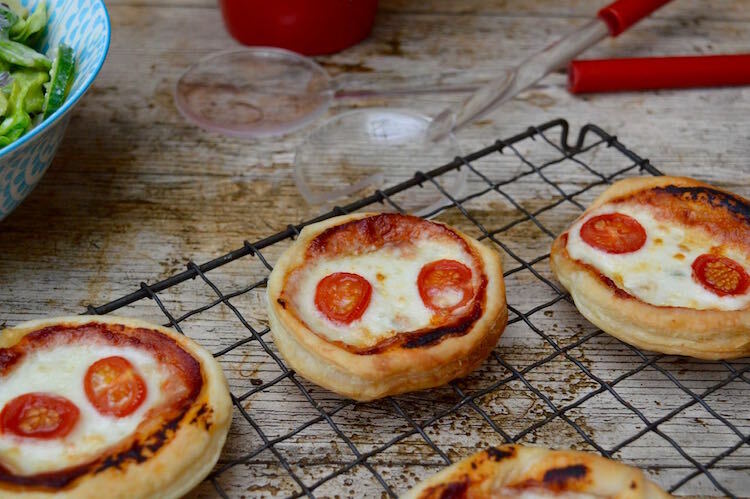 Interesting, will have to make these mini pizzas for myself! I had a mam who liked to bake loads (and still does) and she taught me how to bake and cook! I always remember making jam tarts with her lemon curd were my favourite and didn’t last long! My 11 year old vegetarian son would love this book! we used to bake cinnamon scones with my mum, and apple pie with my grandma (I remember making that when we found out my mum had my baby brother when I was 9! ), funny that now we have a cat called cinnamon! Cinnamon scones sound divine and I bet your cat is a beautiful cinnamon colour. We used to bake cookies, flapjacks and cupcakes when we were in the Brownies. I learnt to make cakes with my Nan. I still make cakes the same way today & have taught my Granddaughter the same. One of my earliest memories is making flapjacks with my mum as a little girl! Flapjacks are a great bake to make when you’re little. So easy and so delicious. Wow, that is baking on a big scale. Bet that Barm Brack was delicious. These sounds fab! I think even my picky daughter could be tempted by them. Oh no! I didn’t realise you had a picky daughter Claire. Have you tried them on her? I must try these – sad I live too far away for your giveaway but I like the sound of the book so may end up purchasing it. It’s a really good book Johanna irrespective of Jac having created the recipes for it. Though that does, of course, make it extra special. It’s a great book for kids! I too made the puff pizzas soooo easy and tasty!! Aren’t they just Lisa. Sometimes you need something that’s just quick and easy to put together. That sounds wonderful. I bet your Gran was a very popular woman. I can remember baking with Mum..cakes mostly. I remember cookery lessons at school, we had so much fun! It seems a bit sad they don’t do these anymore. I learnt quite a bit when we had them. baking with mum was always a treat; bits of leftover pastry were turned into jam tarts filled with mums home made preserves; mini sponge cakes turned into butterfly cakes with delicate sponge wings and lots of sugar strands in multi colours and helping mum decorate a cake was always a treat lots of silver sugar balls turned it into a crunchy treat! Jam tarts are my abiding memory too – always with homemade jam. Making ‘rusks’ with my nan. I have never seen rusks for sale anywhere and don’t know anyone that has eaten them outside of my family. They are savory scone type things, served with a dab of butter. Anyone know a recipe? Rusks. Gosh yes, I’d completely forgotten about those. I have had them way back when. A recipe would be good. My Mum used to love baking at the weekends, and I always got to lick the spoon which I *LOVED*!